We have driven through the Roosevelt Arch, collected our park pass from the tollbooth, and are heading toward the town of Mammoth to pick up our backcountry permits for Pebble Creek and Cache Creek. I am supposed to be navigating for Frances, but I’m thinking about trout. Did you know that each American state has a state fish? In Montana it’s the cutthroat trout, elected by public poll in 1977. Over 200,000 Montanans thought it important enough to bother voting: not bad in a state that was at that time home to just 760,000 men, women, and children, a bigger percentage of voters than bothered to cast a ballot in the last presidential election. Everyone tells me that they preferred the cutthroat over other candidates because it was appropriately symbolic of clean, cold water; of healthy aquatic habitat; of Montana’s natural heritage. By way of contrast, Montana continues to market itself as “The Treasure State,” as it has since gaining statehood in 1889. The official seal and state flag both depict the plow, pick, and shovel, and the state motto remains Oro y Plata, Spanish for “Gold and Silver.” The legacy of mining is everywhere. As an angler you can’t help but wince whenever you find out that an apparently beautiful stream is a designated Superfund site, a place so polluted by mine tailings that it has been officially earmarked by the US Environmental Protection Agency. Mind you, compelling anyone to do the cleanup always seems some way off. I much prefer the state fish to the state motto. Heaps of other folk feel the same way, and not just Montanans. 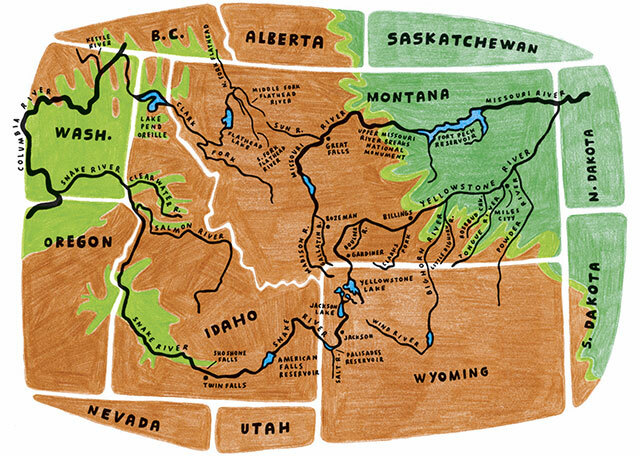 Very shortly, even before we get to Mammoth, we’ll be in Wyoming, and in 1987, not to be outdone by Montana, the people of that state also chose the cutthroat trout as their state fish. Then in 1990, Idaho, the other state having territory within the park, adopted the cutthroat too. I was eleven the first time I heard of the cutthroat trout. It was 1973 and I had borrowed a book—Joe Brooks’s Trout Fishing—from my small-town library, where everything was on a two-week rotation from the city, never to be seen again once you returned it. I opened the cover and found page after page of glorious American salmonids that I never knew existed. I was intrigued by the Dolly Varden, steelhead, and grayling, but two fish came to dominate my imagination: the golden trout, which I hope to encounter soon enough, and the one with which I have recently become obsessed. The very name—cutthroat—must surely account for part of the attraction: it reeks of romance, fantasy, and danger. Trout Fishing—like Back to the Klondike!—was utterly captivating. At the end of two weeks I could not bring myself to return it. First I pretended that I had mislaid it, then that my autistic brother must have “disappeared” it in the open fireplace or down the septic tank. Eventually, when I could stall no more, I admitted that I had lost it and paid the fine out of my own pocket money. My mother knew I was lying. Even the librarian eyeballed me over the top of her wire-framed glasses. Worse, I understood that paying for the book did not absolve me from having committed my crime. Forty years on, the guilt is still there. But I still won’t give it up. If necessary, I would steal it again. A raven caws, and I look up from the Yellowstone map. I see him on the roadside and he utters a maudlin “nevermore” before hopping thrice and flying off. I think of why I am here, and shudder. Edgar Allan Poe is famous not just for “The Raven,” but also for having introduced the Scandinavian word maelström into the English language. And as if that wasn’t enough, he practically invented the detective story. At least, The Purloined Letter and The Murders in the Rue Morgue were so perfect that their structure has come to de ne the genre. And now, one and a half centuries after these stories were written, Yellowstone National Park has offered up an American mystery as great as any Poe ever contrived. Locally, the facts of the case are well known: in 1989, piscivorous lake trout, mackinaw to those of us who fish New Zealand, were illegally introduced into Yellowstone Lake and supposedly have eaten enough Yellowstone cutthroat trout to bring them to the brink of extinction. The mysteries are manifold: Who is responsible for the mackinaw being there? Can anything be done? Will justice prevail? Common sense, even? Or is vengeance and face-saving more important than the outcome? The supporting evidence poses many more questions than it purports to answer, and some months ago, I came to fancy myself as Poe’s eccentric amateur sleuth on a certain path to outwit the official police force. That feeling, I’m nervous to admit, hasn’t entirely gone away. When I first heard that Yellowstone Lake had been illegally stocked, I assumed that the mackinaw had been liberated as fry or fingerlings. But chemical analysis of mackinaw ear-bones—on which the assumption of illegal stocking is based—is said to “prove” that the fish were liberated as adults in 1989. The never-discussed implication of this work is that an amateur angler somehow transferred hundreds, more likely thousands, of large mackinaw from neighboring Lewis Lake. I know firsthand how hard it can be to collect large numbers of adult fish from the wild. Tasmania’s wild brown trout fisheries are so robust that stocks are usually limited by the carrying capacity of the lakes rather than recruitment: the more fish removed from the water, the greater the survival of naturally spawned fingerlings. For this reason the annual harvest of brown trout by recreational anglers in our most-fished waters has no measurable impact on fish stocks. For half a century, Tasmanian fisheries managers have taken good advantage of this remarkable fact, transferring highland brown trout to lowland waters without adversely affecting the waters from which they have been sourced. And when liberated into our few understocked waters—mainly small dams without adequate spawning streams—these “wild transfers” have grown well and provided outstanding sport. Traditionally, the only other widespread stocking was done by collecting ova from wild trout spawners and releasing the hatchlings before they started feeding. These fish were almost cost-free, essentially wild, and did well enough—especially when placed into waters that did not contain red fin perch. In Tasmania in the late 1980s and early 1990s, I spent several winters working for the Inland Fisheries Commission collecting adult brown trout, and even though we had the luxury of official fish traps on major spawning creeks, we often struggled to collect the requisite number of trout. By all accounts, adult mackinaw are more difficult to collect than adult brown trout. Typically, they live 60 to 120 feet below the surface and do not congregate in streams to spawn. How could an amateur fisherman catch so many of them? How could he keep them alive and transfer them nine miles by road from Lewis Lake to Yellowstone Lake? How did he avoid suspicion? (Not even the offer of a reward tempted anyone to come forward with information that may have led to “the capture and conviction of the person or persons responsible.”) Why have none of the dozens of journalists who have reported on this problem for regional newspapers, fishing magazines, national broadsheets, and scientific journals alluded to this fundamental riddle? Over the decades, while researching the various incarnations of my Tasmanian guidebook, I’ve needed to pinpoint unsanctioned releases of trout. The liberations themselves have invariably been simple operations: usually a cupful of sac-fry was purloined from a hatchery, or dip-netted from a creek, and placed into a plastic bag along with a few cups of water and a few quarts of oxygen; the fish were then stuffed into a backpack, walked into the wilderness, and liberated into a hitherto fish-free lake. Each of these tiny sorties was undertaken by one or two anglers on foot in untracked wilderness, and each, by its very nature, should have been easy to conceal, yet I usually got to the root of things within a few weeks or months. People like to boast, and I have found that if I talk to enough anglers, I get plenty of solid leads. What, I wonder, can be so hard about tracking down the perpetrator of an industrial-scale operation in one of the most-visited trout fisheries on the planet? The coalition of “everyone else” includes the US Geological Survey, National Park Service, US Fish and Wildlife Service, independent scientists, Trout Unlimited, independent angling clubs, the governments of Montana, Wyoming, and Idaho, and a plethora of conservation societies. So rarely do such disparate groups unanimously agree with one another, so rarely do even a few come together in a spirit of unity, that the Yellowstone disaster seems to offer hope—if not for the native fish, then at least for humanity— and this may be why the suppression of the mackinaw has become such a cause célèbre. The tragedy came on the heels of a great success story. By the early 1970s, decades of overfishing in Yellowstone Lake and associated streams had resulted in catch rates that were by far the lowest on record. So angling regulations restricting harvest were introduced, then tweaked and tweaked again. Better still, the anglers themselves came to quickly embrace the catch-and-release ethos. Fish numbers rebounded more quickly than anyone could have predicted. From the mid-1970s to the early 1990s, the lake was said to contain somewhere between 3.5 million and 4 million fish, which implied that the population had been restored to the pre-European norm. But from 1994 (when the first mackinaw was caught) to 2004, the estimated population of lake-dwelling cutthroats dropped to perhaps 75,000 fish, which was much lower than the population in the early 1970s. The published data suggests that Yellowstone Lake currently holds about 100,000 cutthroat trout, at best 400,000, and that they have to compete with perhaps 500,000 mackinaw. Even worse, I am told, each mackinaw is eating up to forty cutthroats per year, all of fingerling size or better. I can’t make the math work. Another problem: the published data says that cutthroat trout from Yellowstone Lake spawn in rivers, and that when they drop back to the lake, the great majority feed in the shoreline shallows. This suggests that cutthroat trout and mackinaw mostly occupy completely different habitats. So when and where is the predation occurring? And why has it been so devastating? Early on in my research, the thing that really struck me was that absolutely no one involved in the rehabilitation program—not the anglers, not the biologists, not the ecologists, not the conservationists—would countenance the resurrection of the local hatchery. Now for another tantalizing fact: the year the mackinaw are supposed to have been illegally introduced into Yellowstone Lake, 1989, is the year after unprecedented wildfires ravaged the national park. A number of pundits, including some who are not barking mad, have suggested that the mackinaw were inadvertently hoisted out of Lake Lewis by helicopters that were ferrying water buckets to fight the fires. Plenty of people have picked holes in this theory, however. For a start, so they say, the hotter the weather, the deeper the mackinaw, so what were the chances of picking up adults in buckets? And what were the chances of hundreds of fish flip-flopping across land that was at best parched, more likely smoldering, all the way into Yellowstone Lake’s tributaries? I was delighted to read that a few observers pointed an accusatory finger at waterbirds. I had a Carl Barks–like vision of an open-mouthed cartoon pelican flying high over the scorched Yellowstone wilderness, her beak full of innocent fish staring in goggle-eyed wonder at the smoky wasteland. Ah, well—every good detective story has to have its unlikely suspect. I am starting to feel a bit grandiose again. This time I fancy myself not as an amateur sleuth but rather a type of Lone Ranger riding into town on a dark horse. I have vengeance on my mind. I lost my home water, my dear Lake Sorell, because of a carp-eradication project, and I’ll be damned if I’ll stand by and let this sort of thing happen elsewhere. A much worse thought though, and a much more likely one, is that incompetence or a lack of imagination is not the problem. In Tasmania, I lost the Lagoon of Islands too, and the scientists working on that rehabilitation program were brilliant. Prolonged drought was found to be the culprit in that case, though when the drought persists through decades, you have to say it looks increasingly like climate change. What can anyone do about that? I feel better when I have someone to blame and, really, like everyone else here in Yellowstone, I want to blame the mackinaw. If they truly are the problem, that will be the easiest thing to live with. The spawning runs in Yellowstone Lake are in catastrophic decline, though some spawning streams are faring much better than others. Catch rates are down (though not by the generally accepted 90 to 98 percent; it’s actually more like 50 to 60 percent) and sizes are up. Angling pressure has fallen dramatically at Yellowstone Lake and in the Yellowstone River downstream of the lake. No one knows how the mackinaw were transferred into Yellowstone Lake, and it bothers me more than seems reasonable that the term “illegally stocked” is ubiquitous in published reporting, including scientific journals. The suppression program has not suppressed the mackinaw. The population is said to be doubling every year and must soon climax, if it hasn’t already. For all of these reasons I am here one year earlier than planned. Frances put up several legitimate arguments for sticking to our original schedule, whereby we were to incorporate this trip into an extended tour of the Americas in 2014. But the Yellowstone fishery was on a precipice, and if I had waited another couple of years, I might not have had the chance to experience it. Even if the Yellowstone cutthroat population remained high enough to sustain a viable fishery, what would happen if the population was listed as endangered under the Endangered Species Act? Would forty years of dreaming simply evaporate? Right now I am filled with an urgency of the sort one feels when racing home to see an aging parent after a sudden illness. Or perhaps the urgency is more like the impatience I once felt for visiting undocumented wilderness fisheries in Tasmania—there is a great story to be told and I don’t want anyone to beat me to it. There is no doubt about it: the plight of the Yellowstone cutthroat trout has given me a passion for living that I’ve not experienced for years. I am grateful for it. And I find this gratitude for tragedy so disturbing that I sometimes wonder if any good at all can come from my being here. 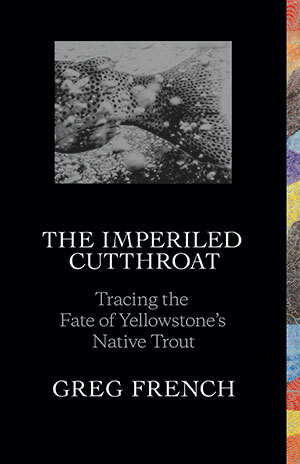 Excerpted from The Imperiled Cutthroat: Tracing the Fate of Yellowstone’s Native Trout by Greg French © 2016 Patagonia. Used with permission.